LeisureMod Wilson Twill Fabric Eiffel Rocking Chair in Beige by LeisureMod at Indsight. MPN: WR25BGT. Hurry! Limited time offer. Offer valid only while supplies last. The Wilson Rocking Chair is a one of a kind piece that is sure to turn heads. This trendy chair makes for a unique decoration and a comfortable seat. The Wilson Rocking Chair is a one of a kind piece that is sure to turn heads. 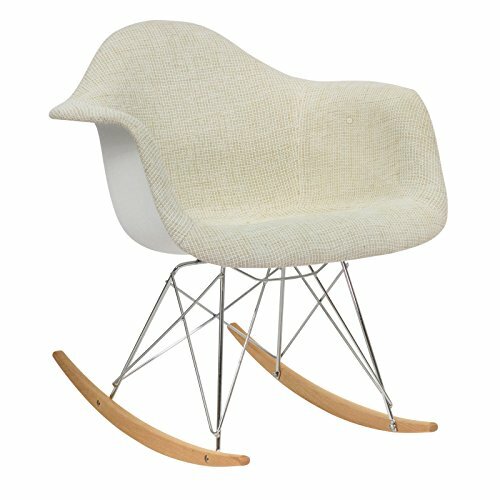 This trendy chair makes for a unique decoration and a comfortable seat. With its sturdy design and vibrant coloring, this chair is a perfect fit for any nursery or children's room. Sit in comfort while reading bed time stories and as you rock your child to sleep. Add this chair to any room so you can chill out while you rock out, a guaranteed favorite for all. Foam cushioned seat. Textured polyester outer fabric. Seat is protected with ABS plastic shell.